Every day the Greater NY Red Cross Emergency Communications Center (ECC) located on the second floor in an unassuming 4-story building on West 49th Street, a few blocks from midtown Manhattan, performs some of the most important functions needed to shelter, feed and provide emotional support to victims of disasters. Via state-of-the-art communication systems, ECC reps monitor 24/7, 365 days a year. The ECC serves the Greater New York Region, an area with a population in excess of 12.9 million residents. In addition to the eight million people in New York City’s five boroughs, the Center serves the Metro New York North area (1.8 million people) in Greenwich Conn., West Point, Orange, Putnam and Westchester Counties; and serves 2.8 million people in Nassau and Suffolk Counties on Long Island. The Center also responds to calls for assistance from more than two dozen cities and towns in the Eastern New York State Region with an additional population of 2.5 million residents. 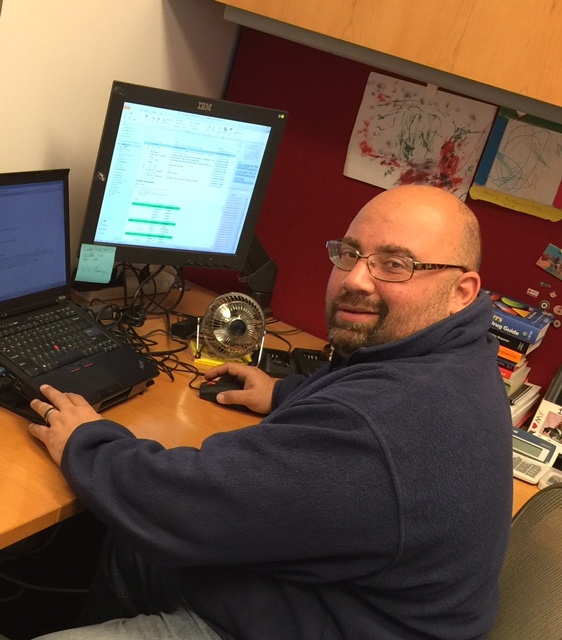 Chris Mercado, a ten-year veteran of the Red Cross, manages the ECC. “The Center is the source of all information and the starting point for all response activity for the Red Cross in Greater New York,” he says. Chris Mercado, a 10-year Red Cross veteran, manages the ECC. Chris staffs the Center with highly-trained and dedicated employees and volunteers. ECC representatives maintain 8-hour shifts around the clock at the Center. The Center is outfitted with the latest, state-of-the-art audiovisual and IT systems and helps coordinate the Red Cross response in Greater NY to 7 to 10 disasters every day, including home fires, floods, water main breaks, building collapses, severe weather events and other emergencies. On 9/11, the Center (at the time located in their previous HQ near Lincoln Center) was among the first to send responders to the terrorist attack at the World Trade Center. The ECC has back-up communication systems. If electrical power is lost, a self-sustaining power generator can maintain power for 48 hours. The Center can also activate satellite phones if necessary; and if cellular power is lost, the Center has its own FCC-licensed ham radio station to communicate with field operations. can communicate with field operations. One or two ECC representatives are on duty at all times, surrounded by an array of TV screens, computer monitors, telephones and fire scanners. The TV screens are always tuned in to local and national news stations to monitor for breaking news. One computer is used for incoming and outgoing Breaking News Network email messages; other computers are used by the reps on duty to draft detailed reports on every reported incident. The reports are sent 24/7 to senior Red Cross staff and include the current status of all incidents (e.g. the number of buildings and families affected), the current actions being taken by Red Cross staff (e.g. sheltering activities, plans for feeding and housing displaced people) and future Red Cross actions planned (e.g. future casework plans and longer-term feeding/sheltering plans). The emergency scanners are small desk-top devices which link directly to the FDNY. If a fire occurs anywhere in the five boroughs, the reps on duty actually hear the Fire Department dispatcher report it to the local fire department and the Red Cross responders deploy accordingly. If the incident is a minor one such as a minor kitchen fire, the reps will wait for more information from the responding fire department team on the scene. If it is a more serious incident or if the Fire Department calls the ECC directly for assistance, the reps spring into action. First, the ECC rep notifies the Disaster Relief teams located on the 2nd floor staging area to deploy to the emergency. Each team consists of one to three trained volunteers on call 24/7. They immediately procure the appropriate Red Cross vehicle or vehicles located in the basement garage and drive to the scene of the emergency. (Phil Cogan, Jason Lee, Odelia Lee and Ashley Barrueco) ready to respond to emergency calls. The type of vehicle selected will depend on the nature of the emergency. Small vans are equipped with comfort kits, clean-up kits, personal hygiene kits, blankets, clothing, snacks and water. For more serious emergencies such as multiple-alarm fires or large-scale flooding, the Disaster Relief teams will use larger vehicles such as ERVs (Emergency Response Vehicles) which are outfitted with larger quantities of emergency supplies as well as emergency generators. The ERVs are equipped not only to assist disaster victims but also first responders who often remain on site for extended periods of time. If needed, a highly-sophisticated Red Cross Field Communications Vehicle is sent out to assist operations and maintain communications with emergency personnel. ERVs and other Red Cross emergency vehicles are at the ready at all times. Red Cross vehicles are stocked with a variety of relief supplies. In all cases, the ECC representative coordinates the activities of the Disaster Relief teams and keeps Red Cross leadership aware of the field activities as they develop. In many instances, the heads of Logistics, Mass Care, Health, Mental Health, Staffing and Operations Management will go to the scene of the emergency to assist with relief operations. 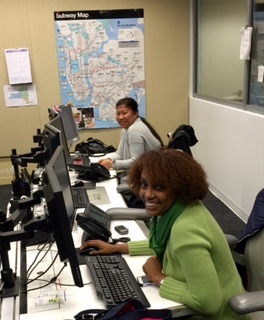 Kerenine LeVeque and Emma Tomias-Soto on duty in the ECC. In addition to monitoring and responding to emergency calls, the ECC reps are also kept busy with calls for information or assistance from numerous NYC agencies such as the NYC Office of Emergency Management (OEM), the NYC Housing Preservation and Development Department (HPD), the New York Department of Buildings (DOB) and other NYC agencies and community partners seeking Red Cross assistance. Approximately 100 other non-emergency calls are received daily from the general public for information or help on everything from blood donations, to sheltering questions, to transportation questions. In the event of high call volume, additional volunteers are brought in to staff the ECC.